AR enabled shopping is starting to become popular now. 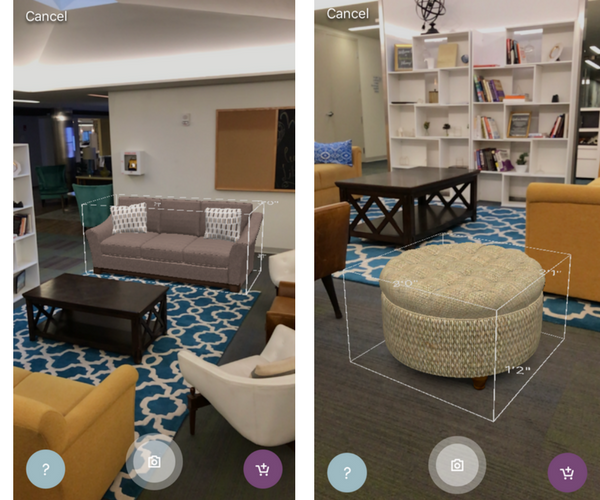 Online furniture retailer Wayfair is now bringing the augmented reality feature into its Wayfair Android App to make your furniture shopping more realistic and fun. Just like Pottery Barn 3D Room View, customers can visualize how the items will look in their living room, bedroom or other parts of the house through their smartphones. Want to know about how this works? Read on. Wayfair’s AR feature is called View in Room 3D. It is already available on the iOS platform, thanks to Apple’s AR platform ARKit. On Android, the developers are using Google’s ARCore to make this option available for users. AR enabled shopping looks to be the way forward as sites like eBay, IKEA, Amazon and Target have launched new tools and features to improve the shopping experience. eBay’s AR feature is specifically designed for sellers to quickly select the best USPS flat rate box for items they need to ship. There’s more AR features lined up for consumers as well. IKEA has just launched IKEA Place with the AR feature enabled and Amazon and Target have been experimenting with it as well. Buying furniture and home décor items is not an easy thing to do, whether you do it online or in person. That’s because most of us find it difficult to visualize what it will look like in our homes. Will the new sofa complement the rug or the curtains? Will the TV stand fit snugly in the space you’ve allocated for it at home? There are, no doubt, a thousand questions and doubts in your mind when it comes to online furniture shopping. Wayfair’s app aims to resolve all of those doubts with AR. Once you open the app, go to the View in Room 3D. Then, raise your smartphone and project the furniture or décor in 3D at full-scale. You can add and remove virtual items to see how well they fit and look in a given room. The furniture and décor you select is automatically anchored to the ground for easy adjustability. Because all images are in 3D, you can walk around it to see it from different angles and see how it looks up close and personal in your own home. This is something that will definitely help you make better purchase decisions. One exciting feature, already available on iOS that is yet to come to Android is AR videos. With AR Videos, you can record a video of the object in AR by pressing and holding the Record button. You can walk around the item, capture it in a more realistic 3D version and share it with your friends and family as well. Wayfair will be incorporating this feature in the app in the coming days. Meanwhile, the AR functionality iyself in the app is subject to a few bugs and glitches. Hopefully, all of this will be fixed in future updates. Over time, shopping for furniture and home décor is sure to be incomplete without augmented reality. If you do most of your furniture shopping at Wayfair, do check out the feature on their app. What do you think of AR enabled shopping? Has it helped you make a better purchase decision? We’d love to hear your thoughts.